Are Fracking Wastewater Wells Poisoning the Ground Beneath Our Feet? Over the past several decades, U.S. industries have injected more than 30 trillion gallons of toxic liquid deep into the earth, using broad expanses of the nation’s geology as an invisible dumping ground. There are growing signs they were mistaken. Records from disparate corners of the United States show that wells drilled to bury this waste deep beneath the ground have repeatedly leaked, sending dangerous chemicals and waste gurgling to the surface or, on occasion, seeping into shallow aquifers that store a significant portion of the nation’s drinking water. In 2010, contaminants from such a well bubbled up in a west Los Angeles dog park. Within the past three years, similar fountains of oil and gas drilling waste have appeared in Oklahoma and Louisiana. In South Florida, 20 of the nation’s most stringently regulated disposal wells failed in the early 1990s, releasing partly treated sewage into aquifers that may one day be needed to supply Miami’s drinking water. Federal officials and many geologists insist that the risks posed by all this dumping are minimal. Accidents are uncommon, they say, and groundwater reserves — from which most Americans get their drinking water — remain safe and far exceed any plausible threat posed by injecting toxic chemicals into the ground. But in interviews, several key experts acknowledged that the idea that injection is safe rests on science that has not kept pace with reality, and on oversight that doesn’t always work. The boom in oil and natural gas drilling is deepening the uncertainties, geologists acknowledge. Drilling produces copious amounts of waste, burdening regulators and demanding hundreds of additional disposal wells. Those wells — more holes punched in the ground — are changing the earth’s geology, adding man-made fractures that allow water and waste to flow more freely. A ProPublica review of well records, case histories and government summaries of more than 220,000 well inspections found that structural failures inside injection wells are routine. From late 2007 to late 2010, one well integrity violation was issued for every six deep injection wells examined — more than 17,000 violations nationally. More than 7,000 wells showed signs that their walls were leaking. Records also show wells are frequently operated in violation of safety regulations and under conditions that greatly increase the risk of fluid leakage and the threat of water contamination. Structurally, a disposal well is the same as an oil or gas well. Tubes of concrete and steel extend anywhere from a few hundred feet to two miles into the earth. At the bottom, the well opens into a natural rock formation. There is no container. Waste simply seeps out, filling tiny spaces left between the grains in the rock like the gaps between stacked marbles. Many scientists and regulators say the alternatives to the injection process — burning waste, treating wastewater, recycling, or disposing of waste on the surface — are far more expensive or bring additional environmental risks. Subterranean waste disposal, they point out, is a cornerstone of the nation’s economy, relied on by the pharmaceutical, agricultural and chemical industries. It’s also critical to a future less dependent on foreign oil: Hydraulic fracturing, “clean coal” technologies, nuclear fuel production, and carbon storage (the keystone of the strategy to address climate change) all count on pushing waste into rock formations below the earth’s surface. The U.S. Environmental Protection Agency, which has primary regulatory authority over the nation’s injection wells, would not discuss specific well failures identified by ProPublica or make staffers available for interviews. The agency also declined to answer many questions in writing, though it sent responses to several. Its director for the Drinking Water Protection Division, Ann Codrington, sent a statement to ProPublica defending the injection program’s effectiveness. Still, some experts see the well failures and leaks discovered so far as signs of broader problems, raising concerns about how much pollution may be leaking out undetected. By the time the damage is discovered, they say, it could be irreversible. In September 2003, Ed Cowley got a call to check out a pool of briny water in a bucolic farm field outside Chico, Texas. Nearby, he said, a stand of trees had begun to wither, their leaves turning crispy brown and falling to the ground. Chico, a town of about 1,000 people 50 miles northwest of Fort Worth, lies in the heart of Texas’ Barnett Shale. Gas wells dot the landscape like mailboxes in suburbia. A short distance away from the murky pond, an oil services company had begun pumping millions of gallons of drilling waste into an injection well. Regulators refer to such waste as salt water or brine, but it often includes less benign contaminants, including fracking chemicals, benzene and other substances known to cause cancer. Before issuing the permit, commission officials studied mathematical models showing that waste could be safely injected into a sandstone layer about one-third of a mile beneath the farm. They specified how much waste could go into the well, under how much pressure, and calculated how far it would dissipate underground. As federal law requires, they also reviewed a quarter-mile radius around the site to make sure waste would not seep back toward the surface through abandoned wells or other holes in the area. Yet the precautions failed. “Salt water” brine migrated from the injection site and shot back to the surface through three old well holes nearby. Despite residents’ fears that the injected waste could be making its way towards their drinking water, commission officials did not sample soil or water near the leak. If the injection well waste “had threatened harm to the ground water in the area, an in-depth RRC investigation would have been initiated,” Ramona Nye, a spokeswoman for Texas’ Railroad Commission, wrote in an email. The agency disputes Cowley’s description of a pool of brine or of dead trees, saying that the waste barely spilled beyond the overflowing wells, though officials could not identify any documents or staffers who contradicted Cowley’s recollections. Accounts similar to Cowley’s appeared in an article about the leak in the Wise County Messenger, a local newspaper. The agency has destroyed its records about the incident, saying it is required to keep them for only two years. After the breach, the commission ordered two of the old wells to be plugged with cement and restricted the rate at which waste could be injected into the well. It did not issue any violations against the disposal company, which had followed Texas’ rules, regulators said. The commission allowed the well operator to continue injecting thousands of barrels of brine into the well each day. A few months later, brine began spurting out of three more old wells nearby. Deep well injection takes place in 32 states, from Pennsylvania to Michigan to California. Most wells are around the Great Lakes and in areas where oil and gas is produced: along the Appalachian crest and the Gulf Coast, in California and in Texas, which has more wells for hazardous industrial waste and oil and gas waste than any other state. Federal rules divide wells into six classes based on the material they hold and the industry that produced it. Class 1 wells handle the most hazardous materials, including fertilizers, acids and deadly compounds such as asbestos, PCBs and cyanide. The energy industry has its own category, Class 2, which includes disposal wells and wells in which fluids are injected to force out trapped oil and gas. The most common wells, called Class 5, are a sort of catch-all for everything left over from the other categories, including storm-water runoff from gas stations. The EPA requires that Class 1 and 2 injection wells be drilled the deepest to assure that the most toxic waste is pushed far below drinking water aquifers. Both types of wells are supposed to be walled with multiple layers of steel tubing and cement and regularly monitored for cracks. Officials’ confidence in this manner of disposal stems not only from safety precautions, but from an understanding of how rock formations trap fluid. Underground waste, officials say, is contained by layer after layer of impermeable rock. If one layer leaks, the next blocks the waste from spreading before it reaches groundwater. The laws of physics and fluid dynamics should ensure that the waste can’t spread far and is diluted as it goes. The layering “is a very strong phenomenon and it’s on our side,” said Susan Hovorka, a senior research scientist at the University of Texas at Austin’s Bureau of Economic Geology. According to risk analyses cited in EPA documents, a significant well leak that leads to water contamination is highly unlikely — on the order of one in a million. Once waste is underground, though, there are few ways to track how far it goes, how quickly or where it winds up. There is plenty of theory, but little data to prove the system works. The hard data that does exist comes from well inspections conducted by federal and state regulators, who can issue citations to operators for injecting illegally, for not maintaining wells, or for operating wells at unsafe pressures. This information is the EPA’s primary means of tracking the system’s health on a national scale. Yet, in response to questions from ProPublica, the EPA acknowledged it has done very little with the data it collects. The agency could not provide ProPublica with a tally of how frequently wells fail or of how often disposal regulations are violated. It has not counted the number of cases of waste migration or contamination in more than 20 years. The agency often accepts reports from state injection regulators that are partly blank, contain conflicting figures or are missing key details, ProPublica found. In 2007, the EPA launched a national data system to centralize reports on injection wells. As of September 2011 — the last time the EPA issued a public update — less than half of the state and local regulatory agencies overseeing injection were contributing to the database. It contained complete information from only a handful of states, accounting for a small fraction of the deep wells in the country. The EPA did not respond to questions seeking more detail about how it handles its data, or about how the agency judges whether its oversight is working. In a 2008 interview with ProPublica, one EPA scientist acknowledged shortcomings in the way the agency oversees the injection program. ProPublica’s analysis of case histories and EPA data from October 2007 to October 2010 showed that when an injection well fails, it is most often because of holes or cracks in the well structure itself. Operators are required to do so-called “mechanical integrity” tests at regular intervals, yearly for Class 1 wells and at least once every five years for Class 2 wells. In 2010, the tests led to more than 7,500 violations nationally, with more than 2,300 wells failing. In Texas, one violation was issued for every three Class 2 wells examined in 2010. Such breakdowns can have serious consequences. Damage to the cement or steel casing can allow fluids to seep into the earth, where they could migrate into water supplies. In September 2009, workers for Unit Petroleum Company discovered oil and gas waste in a roadside ditch in southern Louisiana. After tracing the fluid to a crack in the casing of a nearby injection well, operators tested the rest of the well. Only then did they find another hole — 600 feet down, and just a few hundred feet away from an aquifer that is a source of drinking water for that part of the state. Most well failures are patched within six months of being discovered, EPA data shows, but with as much as five years passing between integrity tests, it can take a while for leaks to be discovered. And not every well can be repaired. Kansas shut down at least 47 injection wells in 2010, filling them with cement and burying them, because their mechanical integrity could not be restored. Louisiana shut down 82. Wyoming shut down 144. Another way wells can leak is if waste is injected with such force that it accidentally shatters the rock meant to contain it. A report published by scientists at the Department of Energy’s Pacific Northwest National Laboratory and the University of Texas said that high pressure is “the driving force” that can help connect deep geologic layers with shallower ones, allowing fluid to seep through the earth. 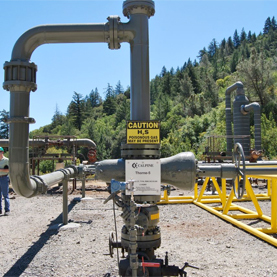 Most injection well permits strictly limit the maximum pressure allowed, but well operators — rushing to dispose of more waste in less time — sometimes break the rules, state regulatory inspections show. According to data provided by states to the EPA, deep well operators have been caught exceeding injection pressure limits more than 1,100 times since 2008. Excessive pressure factored into a 1989 well failure that yielded new clues about the risks of injection. While drilling a disposal well in southern Ohio, workers for the Aristech Chemical Corp. (since bought by Sunoco, and sold again, in 2011, to Haverhill Chemicals) were overwhelmed by the smell of phenol, a deadly chemical the company had injected into two Class 1 wells nearby. Somehow, perhaps over decades, the pollution had risen 1,400 feet through solid rock and was progressing toward surface aquifers. Ohio environmental officials – aided by the EPA – investigated for some 15 years. They concluded that the wells were mechanically sound, but Aristech had injected waste into them faster and under higher pressure than the geologic formation could bear. Though scientists maintain that the Aristech leak was a rarity, they acknowledge that such problems are more likely in places where industrial activity has changed the underground environment. There are upwards of 2 million abandoned and plugged oil and gas wells in the U.S., more than 100,000 of which may not appear in regulators’ records. Sometimes they are just broken off tubes of steel, buried or sticking out of the ground. Many are supposed to be sealed shut with cement, but studies show that cement breaks down over time, allowing seepage up the well structure. Also, if injected waste reaches the bottom of old wells, it can quickly be driven back towards aquifers, as it was in Chico. Clefts left after the earth is cracked open to frack for oil and gas also can connect abandoned wells and waste injection zones. How far these man-made fissures go is still the subject of research and debate, but in some cases they have reached as much as a half-mile, even intersecting fractures from neighboring wells. When injection wells intersect with fracked wells and abandoned wells, the combined effect is that many of the natural protections assumed to be provided by deep underground geology no longer exist. EPA data provides a window into some injection well problems, but not all. There is no way to know how many wells have undetected leaks or to measure the amount of waste escaping from them. In at least some cases, records obtained by ProPublica show, well failures may have contaminated sources of drinking water. Between 2008 and 2011, state regulators reported 150 instances of what the EPA calls “cases of alleged contamination,” in which waste from injection wells purportedly reached aquifers. In 25 instances, the waste came from Class 2 wells. The EPA did not respond to requests for the results of investigations into those incidents or to clarify the standard for reporting a case. The data probably understates the true extent of such incidents, however. Leaking wells can simply go undetected. One Texas study looking for the cause of high salinity in soil found that at least 29 brine injection wells in its study area were likely sending a plume of salt water up into the ground unnoticed. Even when a problem is reported, as in Chico, regulators don’t always do the expensive and time-consuming work necessary to investigate its cause. The practice of injecting waste underground arose as a solution to an environmental crisis. In the first half of the 20th century, toxic waste collected in cesspools, or was dumped in rivers or poured onto fields. As the consequences of unbridled pollution became unacceptable, the country turned to an out-of-sight alternative. Drawing on techniques developed by the oil and gas industry, companies started pumping waste back into wells drilled for resources. Toxic waste became all but invisible. Air and water began to get cleaner. Then a host of unanticipated problems began to arise. In April, 1967 pesticide waste injected by a chemical plant at Denver’s Rocky Mountain Arsenal destabilized a seismic fault, causing a magnitude 5.0 earthquake – strong enough to shatter windows and close schools — and jolting scientists with newfound risks of injection, according to the U.S. Geological Survey. A year later, a corroded hazardous waste well for pulping liquor at the Hammermill Paper Co., in Erie, Pa., ruptured. Five miles away,according to an EPA report, “a noxious black liquid seeped from an abandoned gas well” in Presque Isle State Park. In 1975 in Beaumont, Texas, dioxin and a highly acidic herbicide injected underground by the Velsicol Chemical Corp. burned a hole through its well casing, sending as much as five million gallons of the waste into a nearby drinking water aquifer. Then in August 1984 in Oak Ridge, Tenn., radioactive waste was turned up by water monitoring near a deep injection well at a government nuclear facility. Regulators raced to catch up. In 1974, the Safe Drinking Water Act was passed, establishing a framework for regulating injection. Then, in 1980, the EPA set up the tiered classes of wells and began to establish basic construction standards and inspection schedules. The EPA licensed some state agencies to monitor wells within their borders and handled oversight jointly with others, but all had to meet the baseline requirements of the federal Underground Injection Control program. Even with stricter regulations in place, 17 states – including Alabama, North Carolina, South Carolina and Wisconsin – banned Class 1 hazardous deep well injection. “We just felt like based on the knowledge that we had at that time that it was not something that was really in the best interest of the environment or the state,” said James Warr, who headed Alabama’s Department of Environmental Management at the time. Injection accidents kept cropping up. A 1987 General Accountability Office review put the total number of cases in which waste had migrated from Class 1 hazardous waste wells into underground aquifers at 10 — including the Texas and Pennsylvania sites. Two of those aquifers were considered potential drinking water sources. In 1989, the GAO reported 23 more cases in seven states where oil and gas injection wells had failed and polluted aquifers. New regulations had done little to prevent the problems, the report said, largely because most of the wells involved had been grandfathered in and had not had to comply with key aspects of the rules. Noting four more suspected cases, the report also suggested there could be more well failures, and more widespread pollution, beyond the cases identified. “The full extent to which injected brines have contaminated underground sources of drinking water is unknown,” it stated. Faced with such findings, the federal government drafted more rules aimed at strengthening the injection program. The government outlawed certain types of wells above or near drinking water aquifers, mandating that most industrial waste be injected deeper. The agency also began to hold companies that disposed of hazardous industrial waste to far stiffer standards. To get permits to dispose of hazardous waster after 1988, companies had to prove – using complex models and geological studies — that the stuff they injected wouldn’t migrate anywhere near water supplies for 10,000 years. They were already required to test for fault zones and to conduct reviews to ensure there were no conduits for leakage, such as abandoned wells, within a quarter-mile radius. Later, that became a two-mile minimum radius for some wells. The added regulations would have prevented the vast majority of the accidents that occurred before the late 1980s, EPA officials contend. Today’s injection program, however, faces a new set of problems. As federal regulators toughened rules for injecting hazardous waste, oil and gas companies argued that the new standards could drive them out of business. State oil and gas regulators pushed back against the regulations, too, saying that enforcing the rules for Class 2 wells – which handle the vast majority of injected waste by volume — would be expensive and difficult. Ultimately, the energy industry won a critical change in the federal government’s legal definition of waste: Since 1988, all material resulting from the oil and gas drilling process is considered non-hazardous, regardless of its content or toxicity. The new approach removed many of the constraints on the oil and gas industry. They were no longer required to conduct seismic tests (a stricture that remained in place for Class 1 wells). Operators were allowed to test their wells less frequently for mechanical integrity and the area they had to check for abandoned wells was kept to a minimum – one reason drilling waste kept bubbling to the surface near Chico. Soon after the first Chico incident, Texas expanded the area regulators were required to check for abandoned waste wells (a rule that applied only to certain parts of the state). Doubling the radius they reviewed in Chico to a half mile, they found 13 other injection or oil and gas wells. When they studied the land within a mile – the radius required for review of many Class 1 wells – officials discovered another 35 wells, many dating to the 1950s. The Railroad Commission concluded that the Chico injection well had overflowed: The target rock zone could no longer handle the volume being pushed into it. Trying to cram in more waste at the same speed could cause further leaks, regulators feared. The commission set new limits on how fast the waste could be injected, but did not forbid further disposal. The well remains in use to this day. In late 2008, samples of Chico’s municipal drinking water were found to contain radium, a radioactive derivative of uranium and a common attribute of drilling waste. The water well was a few miles away from the leaking injection well site, but environmental officials said the contaminants discovered in the water well were unrelated, mostly because they didn’t include the level of sodium typical of brine. Since then, Ed Cowley, the public works director, said commission officials have continued to assure him that brine won’t reach Chico’s drinking water. But since the agency keeps allowing more injection and doesn’t track the cumulative volume of waste going into wells in the area, he’s skeptical that they can keep their promise. “I was kind of like, ‘You all need to get together and look at the total amount you are trying to fit through the eye of the needle,’” he said. When sewage flowed from 20 Class 1 wells near Miami into the Upper Floridan aquifer, it challenged some of scientists’ fundamental assumptions about the injection system. The wells – which had helped fuel the growth of South Florida by eliminating the need for expensive water treatment plants — had passed rigorous EPA and state evaluation throughout the 1980s and 1990s. Inspections showed they were structurally sound. As Class 1 wells, they were subject to some of the most frequent tests and closest scrutiny. The wells’ designers would have calculated what is typically called the “zone of influence” — the space that waste injected into the wells was expected to fill. This was based on estimates of how much fluid would be injected and under what pressure. In drawings, the zone of influence typically looks like a Hershey’s kiss, an evenly dispersed plume spreading in a predictable circular fashion away from the bottom of the well. Above the zone, most drawings depict uniform formations of rock not unlike a layer cake. Based on modeling and analysis by some of the most sophisticated engineering consultants in the country, Florida officials, with the EPA’s assent, concluded that waste injected into the Miami-area wells would be forever trapped far below the South Florida peninsula. “All of the modeling indicated that the injectate would be confined in the injection zone,” an EPA spokesperson wrote to ProPublica in a statement. But as Miami poured nearly half a billion gallons of partly treated sewage into the ground each day from the late 1980s through the mid 1990s, hydrogeologists learned that the earth – and the flow of fluids through it – wasn’t as uniform as the models depicted. Florida’s injection wells, for example, had been drilled into rock that was far more porous and fractured than scientists previously understood. Other gaps have emerged between theories of how underground injection should work and how it actually does. Rock layers aren’t always neatly stacked as they appear in engineers’ sketches. They often fold and twist over on themselves. Waste injected into such formations is more likely to spread in lopsided, unpredictable ways than in a uniform cone. It is also likely to channel through spaces in the rock as pressure forces it along the weakest lines. Petroleum engineers in Texas have found that when they pump fluid into one end of an oil reservoir to push oil out the other, the injected fluid sometimes flows around the reservoir, completely missing the targeted zone. “People are still surprised at the route that the injectate is taking or the bypassing that can happen,” said Jean-Philippe Nicot, a research scientist at the University of Texas’ Bureau of Economic Geology. Conventional wisdom says fluids injected underground should spread at a rate of several inches or less each year, and go only as far as they are pushed by the pressure inside the well. In some instances, however, fluids have travelled faster and farther than researchers thought possible. In a 2000 case that wasn’t caused by injection but brought important lessons about how fluids could move underground, hydrogeologists concluded that bacteria-polluted water migrated horizontally underground for several thousand feet in just 26 hours, contaminating a drinking water well in Walkerton, Ontario, and sickening thousands of residents. The fluids travelled 80 times as fast as the standard software model predicted was possible. According to the model, vertical movement of underground fluids shouldn’t be possible at all, or should happen over what scientists call “geologic time”: thousands of years or longer. Yet a 2011 study in Wisconsin found that human viruses had managed to infiltrate deep aquifers, probably moving downward through layers believed to be a permanent seal. According to a study published in April in the journal Ground Water, it’s not a matter of if fluid will move through rock layers, but when. Tom Myers, a hydrologist, drew on research showing that natural faults and fractures are more prevalent than commonly understood to create a model that predicts how chemicals might move in the Marcellus Shale, a dense layer of rock that has been called impermeable. The Marcellus Shale, which stretches from New York to Tennessee, is the focus of intense debate because of concerns that chemicals injected in drilling for natural gas will pollute water. Myers’ work is among the few studies done over the past few decades to compare theories of hydrogeology to what actually happens. But even his research is based on models. “A lot of the concepts and a lot of the regulations that govern this whole practice of subsurface injection is kind of dated at this point,” said one senior EPA hydrologist who was not authorized to speak to ProPublica, and declined to be quoted by name.